Popularly viewed as the leader and most important of the French Impressionists, Monet was certainly a central figure and a prolific landscape painter. However his preferred subjects, almost sub-genres, were gardens (particularly his at Giverny), coastal and inland water views. There were periods during his long career that became dominated by motifs of trees, particularly from 1887 to 1892, when he must have painted more poplars than anyone before or since, in a series of series paintings. I have discussed his series paintings previously. Claude Monet (1840-1926) has several detailed biographies, including an excellent short summary here. He was born in Paris, but brought up in Le Havre, on the Normandy coast, where his family ran a grocery shop. However he started selling caricatures, and took drawing lessons. He met Eugène Boudin in about 1856, who became his mentor and introduced him to plein air painting in oils. He left school in 1857 following the death of his mother, and went to live with an aunt in Paris. There he continued to paint, and in 1862 started lessons at the academy run by Charles Gleyre. There he met Renoir, Bazille, and Sisley, and they become close friends, often painting together plein air. They came under the influence of others, including Jongkind and Manet, and developed ideas following those of Manet. He had two paintings accepted for the Salon, but struggled to sell any of his works. With the outbreak of the Franco-Prussian War in 1870, he fled with his family to London, where he studied the paintings of Turner and Constable, and painted London and the Thames. However his paintings were refused by the Royal Academy in 1871, and he moved to the Netherlands, where he also painted. He returned to France to live in Argenteuil on the River Seine at the end of the year. He exhibited in the first Impressionist exhibition in 1874, where his Impression: Sunrise (1872) was the prompt for the name Impressionism. The family moved to Vétheuil in the summer of 1878, by which time his wife was dying of tuberculosis. After her death in 1879, he lived with the wife of a former patron, now bankrupt. Eventually, with modest commercial success, he was able to move to a house in Giverny, which he bought in 1890 and developed its gardens extensively. From the late 1880s, Monet created sometimes large series of paintings, which proved popular and lucrative. However by the start of the twentieth century, his sight was deteriorating; in 1911, Alice, his second wife, died, leaving him to paint the gardens at Giverny on his own. By the end of the First World War his sight was severely affected by cataracts, and he underwent surgery in 1923. Claude Monet (1840-1926), View At Rouelles, Le Havre (1858), oil on canvas, 46 × 65 cm, Private collection. Wikimedia Commons. View At Rouelles, Le Havre (1858) is believed to be the earliest surviving painting in oils by Monet, and is accomplished in thoroughly realist style. Given that Monet was only 18 when he painting this, and had been learning to paint in oils for just two years, it is strong evidence of his technical abilities and talent. It is also interestingly prescient in containing a row of poplars similar to those which he later painted repeatedly. Claude Monet (1840-1926), The Lemon Grove in Bordighera (1864), oil on canvas, 73.5 × 60.5 cm cm, Ny Carlsberg Glyptotek, København. Wikimedia Commons. During the 1860s, his style started to change rapidly, moving from his early realism. In The Lemon Grove in Bordighera (1864) he has not yet burst into more vivid colours, remaining still a little Barbizon dark, but he shows us his brushstrokes throughout. Each tree is constructed anatomically, each fruit and leaf formed from individual marks, and the grass is carefully textured. At this stage his marks are not as ‘spontaneous’ in appearance, and this painting does seem to have been the result of many days’ careful brushwork. Claude Monet (1840-1926), The Magpie (1868-9), oil on canvas, 89 × 130 cm, Musée d’Orsay, Paris. Wikimedia Commons. 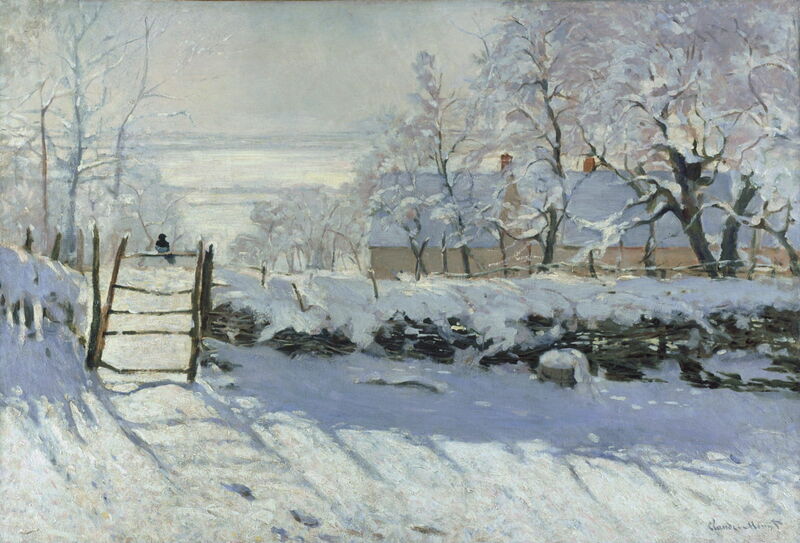 Around 1870, Monet, Renoir, and Pissarro painted many snow scenes. One of Monet’s best-known is paradoxically The Magpie (1868-9), in which the bird is probably the smallest and least conspicuous part of the motif. All three Impressionists constructed bare trees in similar style, the snow and dark bark making sinuous forms. The late 1860s and early 1870s brought increasingly gestural brushstrokes which became a signature of Impressionism, and the development of brilliant colour. 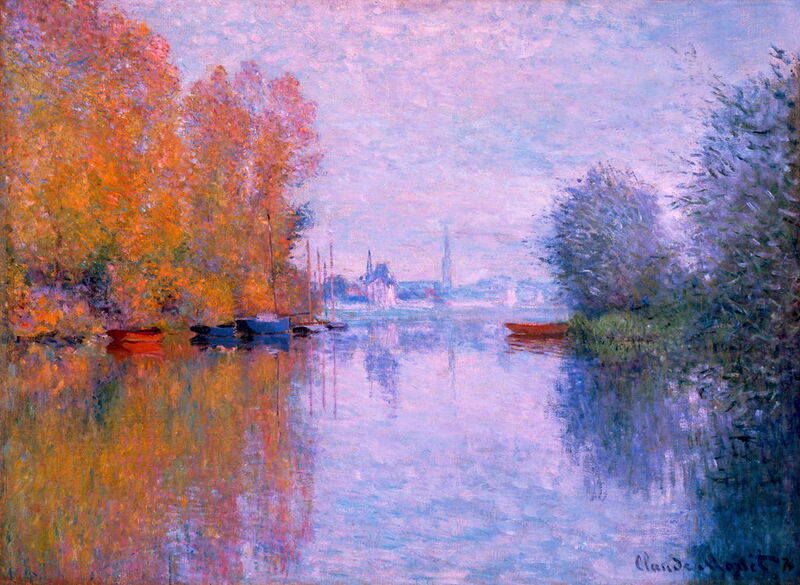 Both are shown well in Autumn on the Seine, Argenteuil (1873), together with Monet’s love of reflections, which he painted meticulously. However these trees have lost their underlying anatomical construction, and only exist in the shimmering foliage. Claude Monet (1840-1926), Summer. Poppies (1875), oil on canvas, 60 × 81 cm, Private collection. Wikimedia Commons. In the 1870s, Monet painted several works featuring figures, usually women and children, in rural landscapes, such as Summer. Poppies (1875). Here his trees only exist in the marks of their foliage, although there is some evidence in the upper half of the tree in the foreground of underlying anatomical construction. Poplars also make another cameo appearance in the middle distance. Claude Monet (1840-1926), Landscape: The Parc Monceau (1876), oil on canvas, 59.7 x 82.6 cm, Metropolitan Museum of Art, New York, NY. Wikimedia Commons. Many of Monet’s finest trees appear in his paintings of parks and gardens, here Landscape: The Parc Monceau (1876) in Paris. The bright colours scumbled roughly across the grass suggest it was painted at speed, but they must have been applied on top of dry paint, which indicates that, if he did start this plein air in front of the motif, it was not completed in a single session. 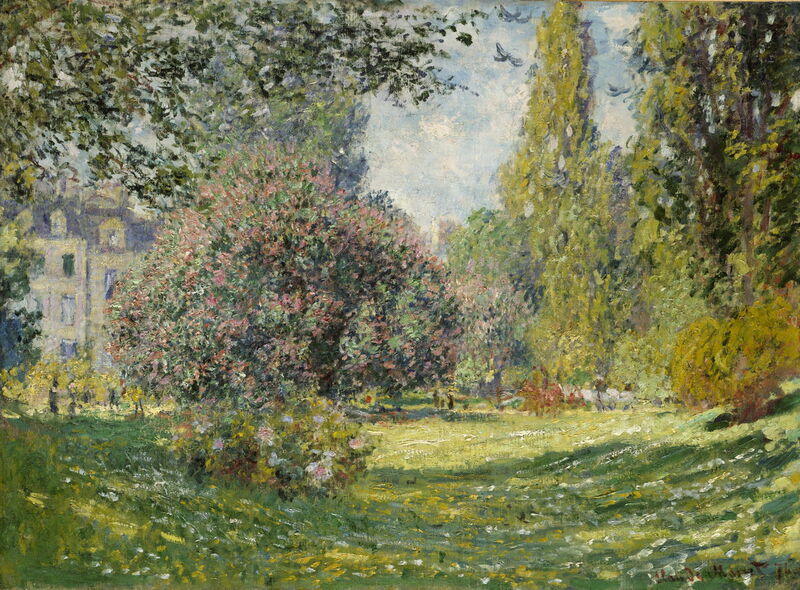 Monet has carefully constructed the overhanging boughs at the top left from the tree’s anatomy, and the blossom on the central tree has been built up using several paint layers. Greens are carefully modulated, and canopies textured using marks of different size, to give studied, almost botanical, differentiation between the species. 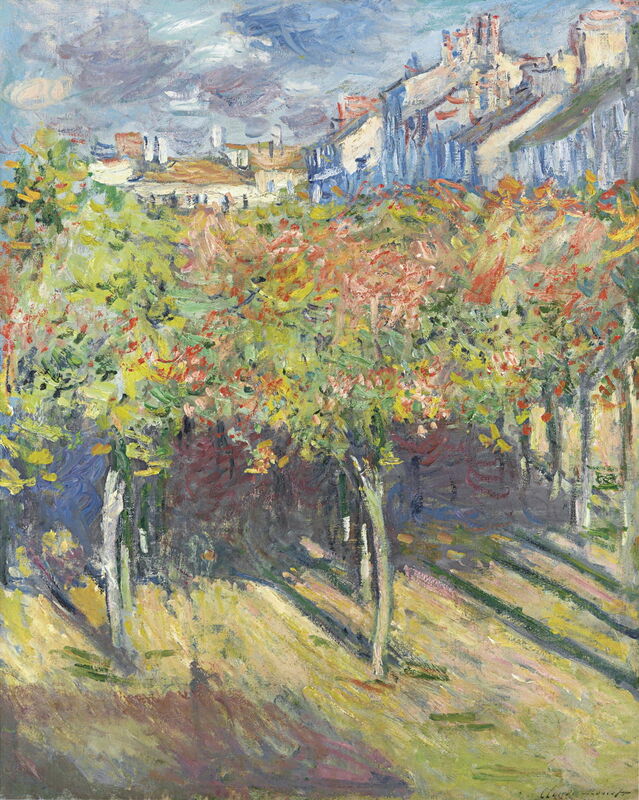 The Lindens of Poissy (1882) gives the impression of even more hasty painting, the linked canopies of its trees being a blur of coarse brushstrokes of contrasting colours. Yet again, though, it appears that the uppermost layers of paint have been applied on dry lower layers. 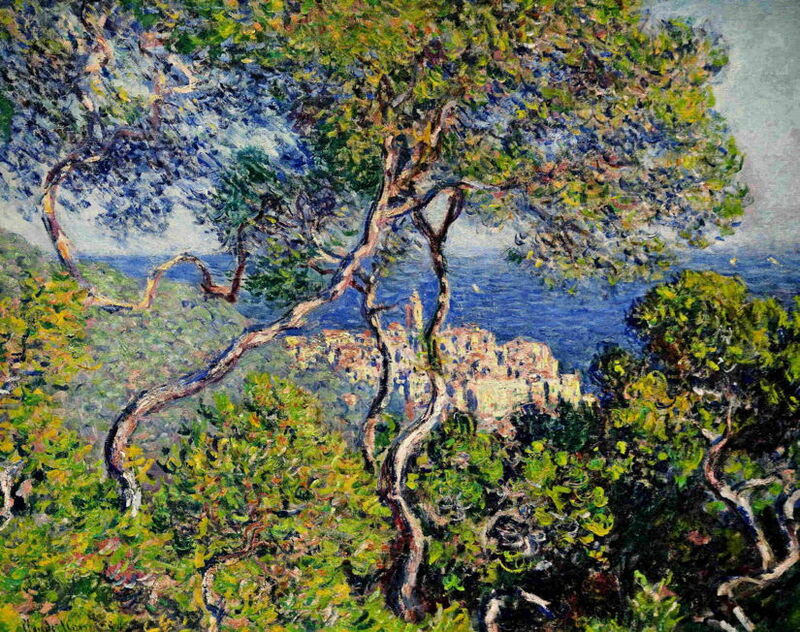 Visits to Bordighera, a seaside town just inside the Italian border on the Mediterranean coast, were made possible by high-speed trains from Paris to Rome, and Monet’s increasing commercial success. In Bordighera (1884), he captures the weird sinuous forms of trees poised above the town, with their richly-coloured bark and intense green foliage. Claude Monet (1840-1926), Garden at Bordighera, Impression of Morning (1884), oil on canvas, 65.5 × 81.5 cm, Hermitage, Saint Petersburg. Wikimedia Commons. 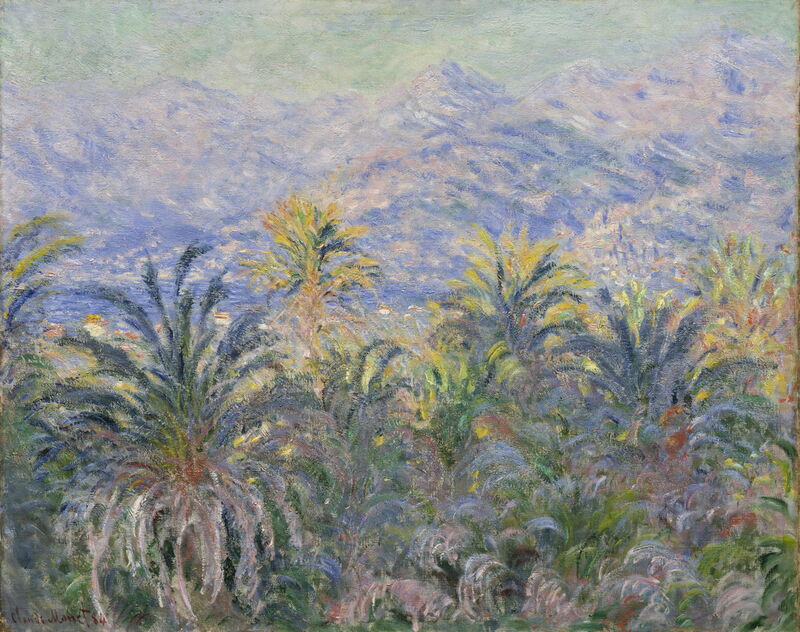 Semi-tropical species such as these palms provided the opportunity for Monet to explore new forms, in the arcs of their fronds, in Garden at Bordighera, Impression of Morning (1884). Claude Monet (1840-1926), Palm Trees at Bordighera (1884), oil on canvas, 64.8 x 81.3 cm, Metropolitan Museum of Art, New York, NY. Wikimedia Commons. Although his brushstrokes were driven by the underlying form of the palm trees, they show no tendency to become organised in the way that those of Vincent van Gogh did. 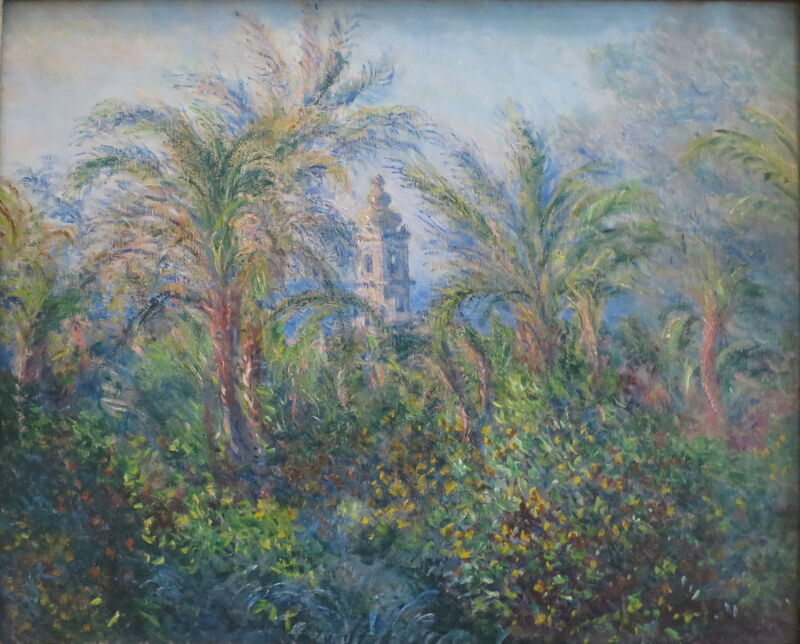 In Monet’s Palm Trees at Bordighera (1884) the marks help distinguish the foreground trees from the sea and hills in the background. He also maintains traditional aerial perspective. 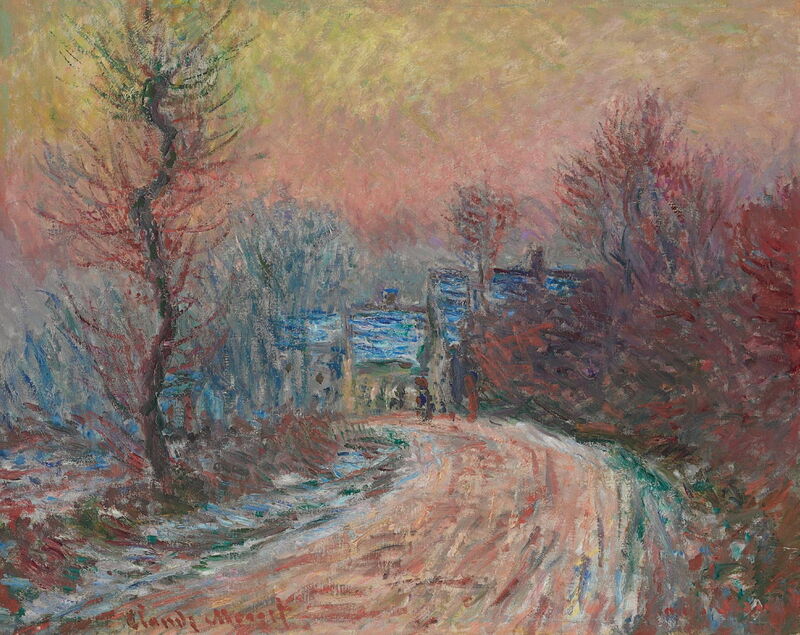 Claude Monet (1840-1926), Entrance to Giverny in Winter, Setting Sun (1885), oil on canvas, 65.5 x 81.2 cm, Private collection. Wikimedia Commons. Back in the north of France, there are rough brushstrokes apparently rushed onto the canvas using strong colours, in Entrance to Giverny in Winter, Setting Sun (1885). Claude Monet (1840-1926), Poplars in the Sun (1887), oil on canvas, 74.3 × 93 cm, Staatsgalerie Stuttgart, Stuttgart. Wikimedia Commons. 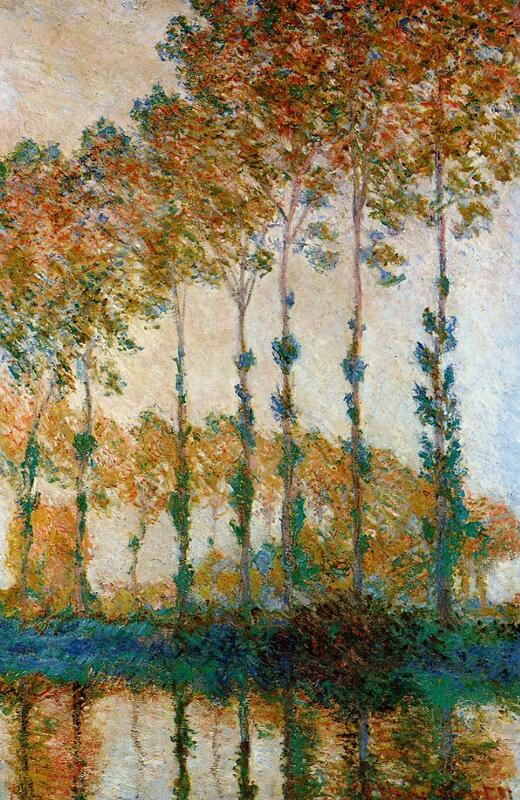 Poplars then started to dominate Monet’s landscapes. At first, as in Poplars in the Sun (1887), they include figures, as they had done a decade earlier. Leaves appear in a general scatter, rather than laid out by the anatomy of branches. 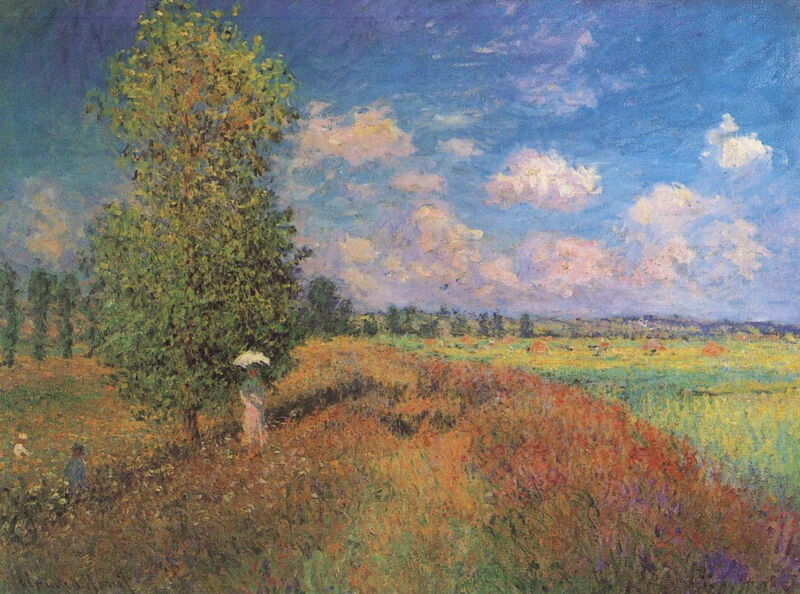 The field and foliage are distinctly dotty, at the time that Pissarro had defected to Neo-Impressionism. 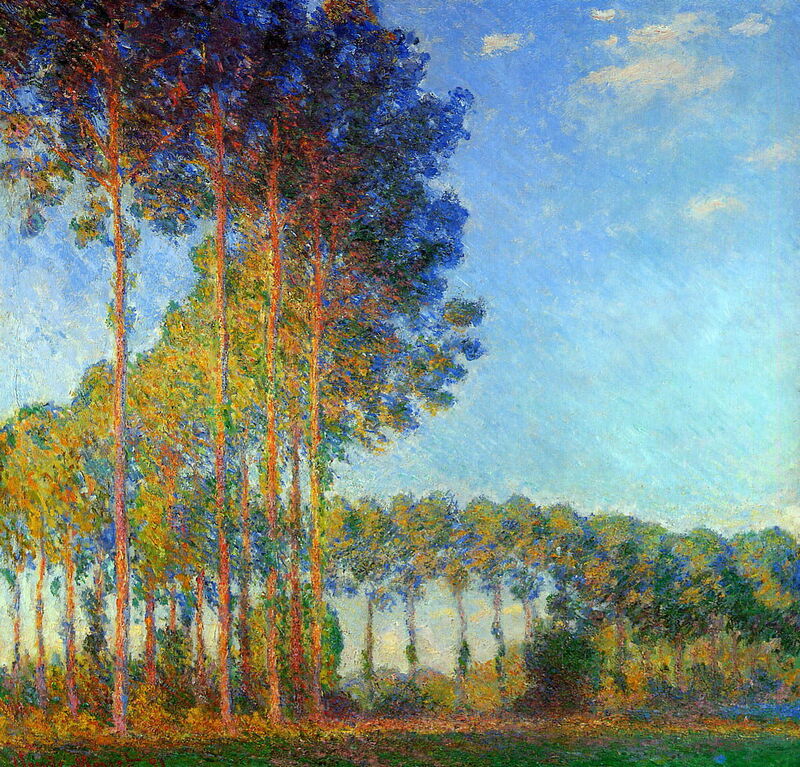 Claude Monet (1840-1926), Poplars at Giverny, Sunrise (1888), oil on canvas, 92.7 × 74 cm, Museum of Modern Art, New York, NY. Courtesy of MOMA Digital Image Collection, via Wikimedia Commons. Over the following few years, Monet painted some of his finest works depicting trees; not just trees in the landscape, but trees as the landscape. 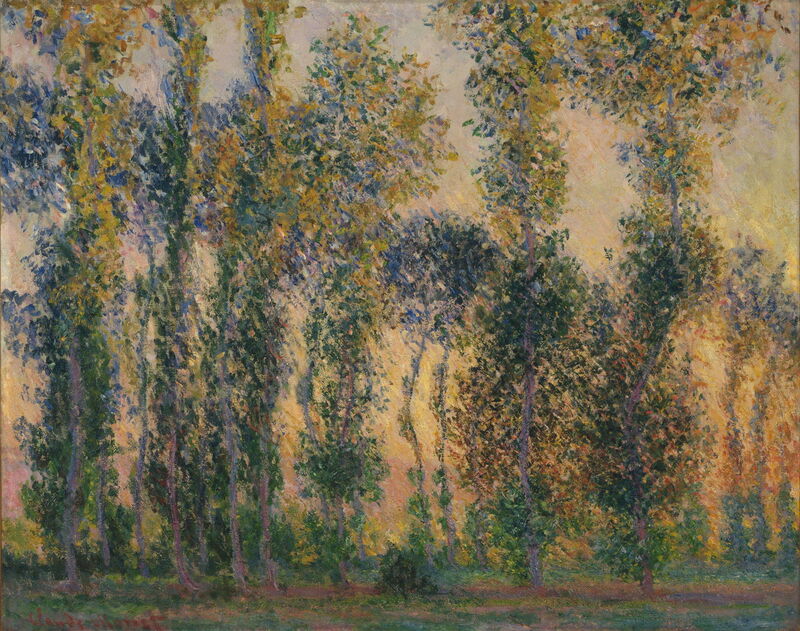 In Poplars at Giverny, Sunrise (1888) the foliage is still a little faltering and uneven, but transiently brilliant colours are starting to appear in those leaves. Claude Monet, Poplars on the Bank of the Epte, Autumn (1891) W1297, oil on canvas, 100 x 65 cm, Museum of Fine Arts, Boston. WikiArt. In 1891, Monet painted his first formal series showing poplars, including Poplars on the Bank of the Epte, Autumn (1891) (Wildenstein number 1297): eleven paintings in all. These articulate the contrasts in form within each tree, with sections of bare trunk, and those of extensive canopy, the colours cast by light and those of the leaves themselves, the rhythmic assembly of the line of trees, their reflections in the water, and the formation of the line of poplars into sweeping curves in depth. Claude Monet, The Three Trees, Autumn (1891) W1308, oil on canvas, 92 x 73 cm, Private collection. WikiArt. A branch of that main series consists of six further paintings of poplars, also completed in 1891, of which The Three Trees, Autumn (1891) (Wildenstein 1308) is an example. These explore the same themes but with different emphasis within them. 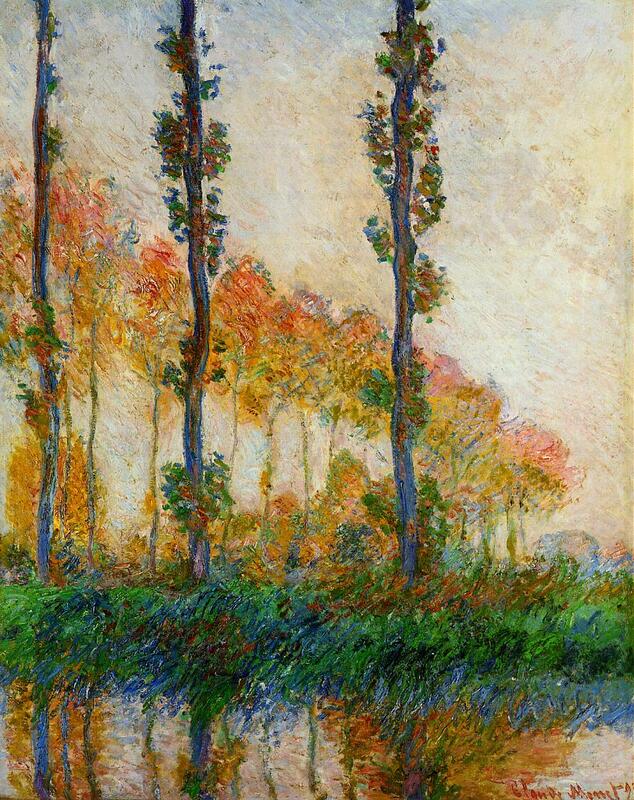 Monet could not stop painting poplars, though. 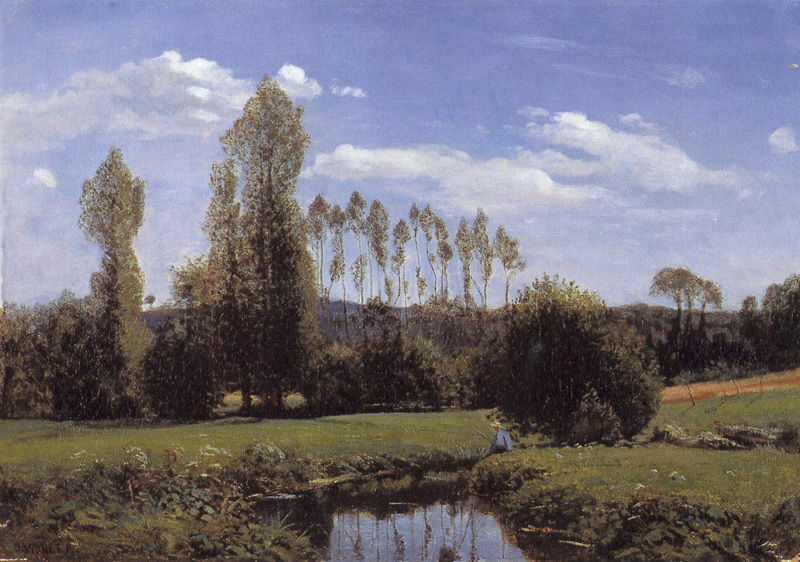 My personal favourite is this, Poplars on the Bank of the Epte (1892), although it has dropped the reflections. It is, perhaps, the quintessential Impressionist painting of trees. 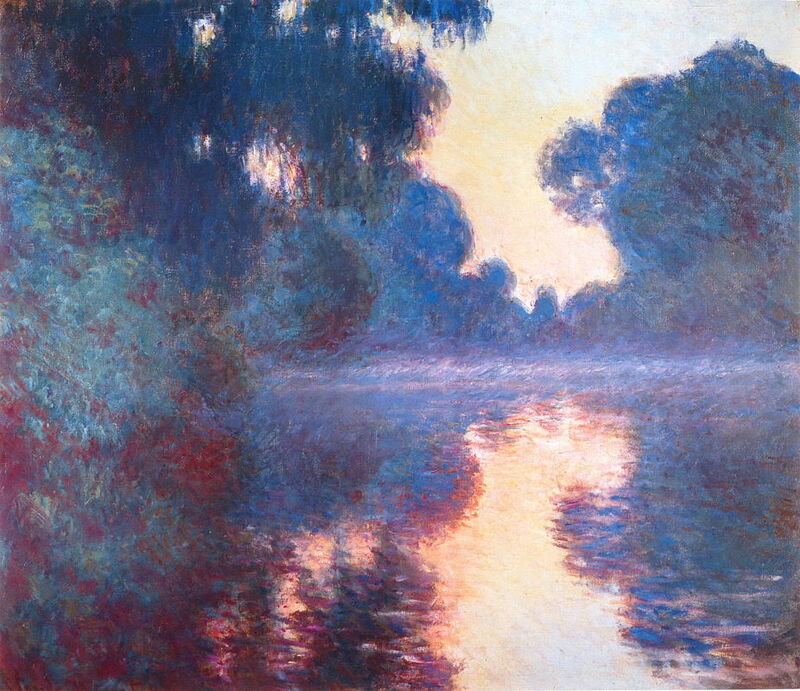 Claude Monet, Branch of the Seine by Giverny at Dawn (1897) W1479, oil on canvas, 81 x 92 cm, Hiroshima Museum of Art, Japan. WikiArt. 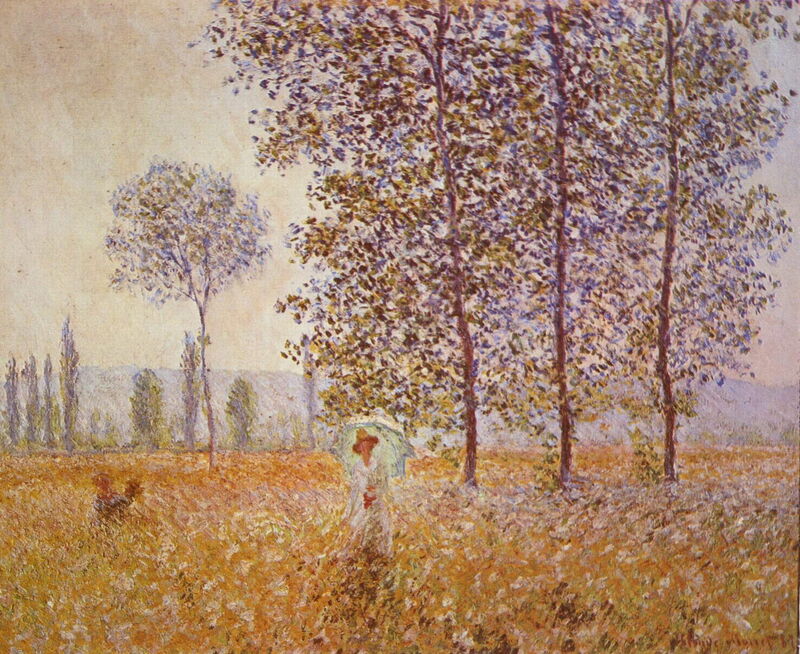 By the mid 1890s, Monet had exhausted the theme of poplars, and travelled further in search of other motifs. 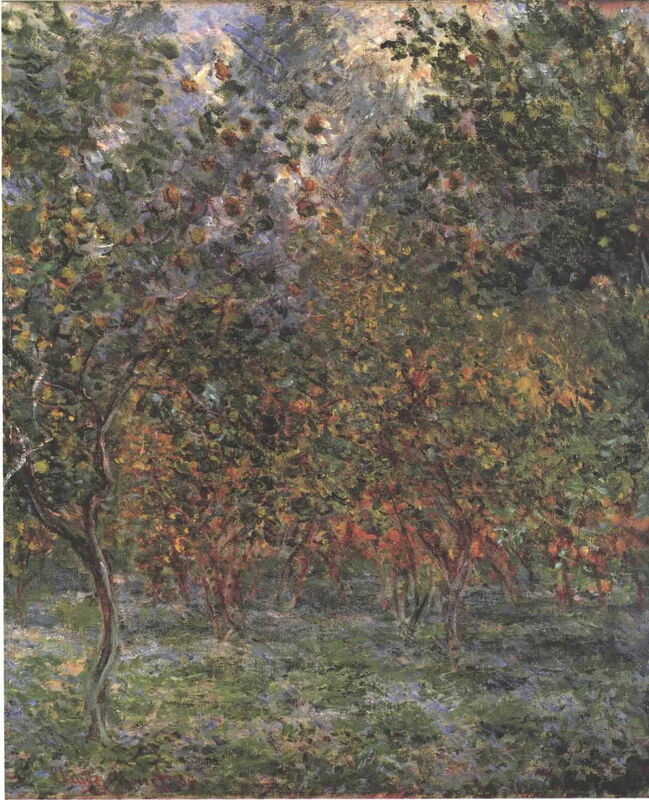 He still worked plein air in and around his garden at Giverny, though, and captured the early blaze of daylight in the dense trees around the river, in Branch of the Seine by Giverny at Dawn (1897). Claude Monet (1840-1926), Morning on the Seine (1898), oil on canvas, 73 × 91.5 cm, National Museum of Western Art, Tokyo. Wikimedia Commons. 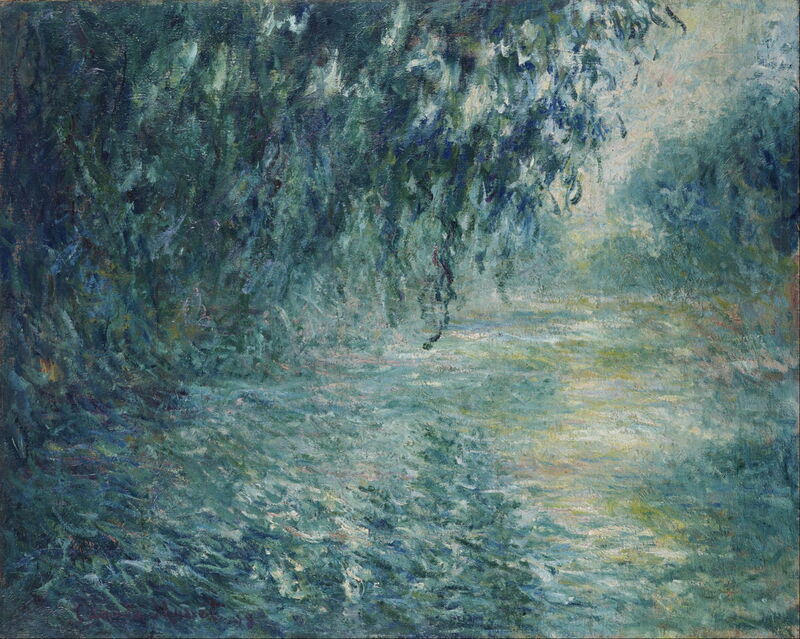 Morning on the Seine (1898) is in better keeping with his paintings of Giverny, in which form appeared to be gradually dissolving, possibly as his eyesight deteriorated. Claude Monet (1840-1926), Weeping Willow (1918), oil on canvas, 131.1 × 110.3 cm, Columbus Museum of Art, Columbus, OH. Wikimedia Commons. Few of Monet’s later paintings make trees their subject. However at the end of the First World War, he completed another series, which he dedicated to the memory of all the French personnel who had died in that war. 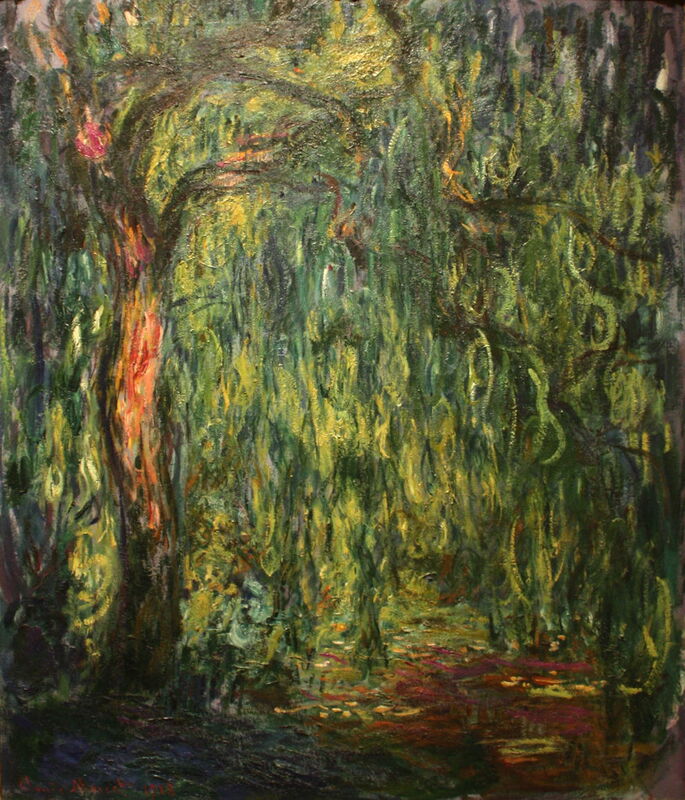 Weeping Willow (1918) is one example, its bright-lit trunk almost lost among the hanging willow leaves. Monet painted many trees in his landscapes, although for much of his career he attended more to motifs of parks and gardens, the sea coast, and inland waterways. The peak of his depictions of trees was in the period 1887-1892, when he painted several series of poplars on the bank of the River Epte, near his home at Giverny. Those very complex compositions explore several areas of form and colour, and are among Monet’s finest works. Indeed, several are among the most outstanding paintings of trees by any artist. If I could have just one painting in this entire series, I think it would probably be Monet’s Poplars on the Bank of the Epte (1892). I have put it on my Amazon wishlist. Greub S (ed) Monet – Lost in Translation, Hirmer Verlag. ISBN 978 3 7774 2428 6. Reviewed here. Skea R (2015) Monet’s Trees, Thames & Hudson. ISBN 978 0 500 23940 7. Reviewed here. Spate V (1992) Claude Monet. The Color of Time, Thames & Hudson. ISBN 0 500 28273 0. Tucker PH (1989) Monet in the ’90s. The Series Paintings, Museum of Fine Arts Boston and Yale UP. ISBN 0 300 04659 6. Wildenstein D (1996) Monet, 4 vols, Taschen and the Wildenstein Institute. ISBN 3 8228 8559 2. Posted in General, Painting and tagged Impression, Impressionism, landscape, Monet, painting, Pissarro, plein air, poplars, Renoir, series, trees. Bookmark the permalink.